This summer at my church, I have been leading a Bible study on Amos. Amos is one of the most focused of the Old Testament prophets; for Amos, the disparity between the wealthy and the poor, and the systems that support that disparity, are fodder for God’s wrath. And he has little else to say. As I was leading our discussion the other day, my mind suddenly flashed back to my Intro to Old Testament class in college. My professor, the Rev. Dr. Richard Rohrbaugh, took something of an historical-anthropological approach to the text. One of the concepts he introduced us to was the world view of “limited good.” I remember him explaining the concept to us, using a xeroxed handout with a circle on it that was supposed to represent a pie (this was the early 1990s, long before the glories of full-color, three-dimensional PowerPoint pies). Someone with a limited good world view assumes that there are only so many material goods to go around. In an agrarian economy, that means there is a limit to the amount of food, building materials, and other necessities which can be produced from the land and distributed to the people of the community. In a money economy, it means there is a limit to the amount of money which can be held by all of the people. Therefore, if some people have more than their share of the goods, then other people have less than their share. The concept was illustrated by the pie picture; if one piece is too big, then all the other pieces must be smaller. The Old Testament prophets spoke from a world view of limited good. That reason alone was why they ranted over the systemic disparity between the rich and the poor, and, thus says the Lord, harangued the rich with the warning that they would be punished if they didn’t share their wealth with the poor. They didn’t care whether or how the rich people came to possess their wealth, they didn’t care whether the poor were trying to get a job or do something else to earn a living, and they didn’t care exactly how the rich were going to give away some of what they had. What mattered to them was the injustice of the skewed distribution of the limited good: some had too much, which meant that others didn’t have enough of the limited resources in the world. Modern capitalism has given us a different world view. In modern capitalism, the assumption is that good is unlimited. The boundaries of the pie picture do not make any sense. New wealth can be created where it didn’t exist before. New resources can continually be produced. Therefore, to someone who holds the assumptions of modern capitalism, rich people haven’t taken more than their share of anything; they have earned their wealth by creating it. And poor people have not been cheated out of anything, either; they simply have not been willing or able to to their part to participate in the creation of wealth. This difference in world view is one difference between a naturalist and a gardener. A naturalist looks at the world and sees limited resources. The ecosystem can only sustain life to the limits of the available resources. A desert environment, with limited water, cannot sustain a meadow. A subarctic environment, with frequent and sustained freezes, cannot sustain poinsettias. A mountaintop is beautiful in part because of its sparse flora, just like a rain forest is beautiful because of its density. The naturalist appreciates a system balanced by the limits of the water, soil, light, air temperature, and other elements of the environment. A gardener, on the other hand, looks at his or her plot of land and sees its potential based on a world view of unlimited good. The hibiscus will thrive over there if I just water it regularly. That little patch of hard clay will sustain a host of tightly-planted vegetables if I just till it well. If it fails, I will truck in more topsoil from some other place. And I can maintain a monoculture meadow of St. Augustine grass in Phoenix if I just program the automatic sprinkler system correctly. 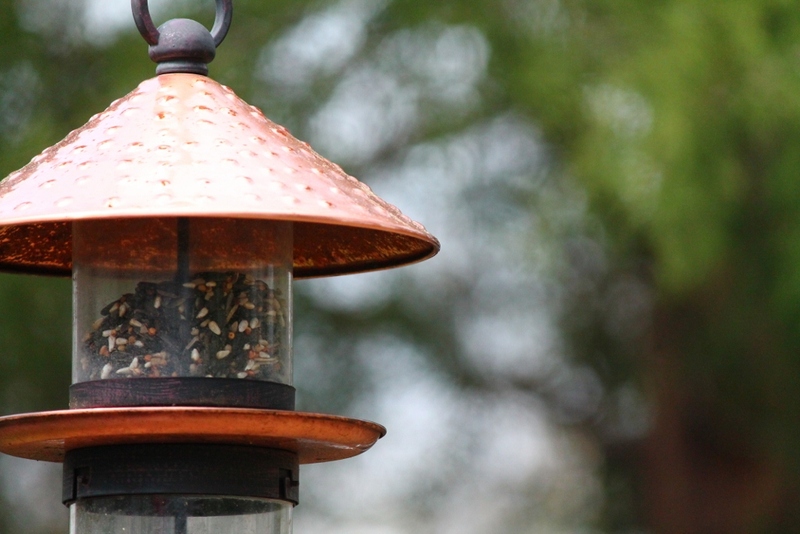 Even a backyard bird feeder represents an effort to transcend the limits of a yard to welcome creatures which otherwise would not be there in any significant number. Naturally, these are generalizations which serve to illustrate a concept. There are naturalists who find ways to justify the engineering of nature to try to break through the limits of a system. And there are gardeners who design xeriscapes or use other methods to make sure their gardens do not use more resources than their environment provides naturally. But I hope you get the point. My sudden recollection of the difference between a world view of limited good and a world view of unlimited good helped me to see why many of us in the Bible study this summer are feeling beaten down by Amos. His poetic rants against the rich just don’t make much sense to those of us raised with the assumptions of modern capitalism. We want answers to the questions we have been taught to ask: how do we give to the poor in a way that doesn’t make them dependent on us? How do we decide which of the poor deserve help and which do not? And how do we make sense of the problem of poverty that seems to be so much bigger than our individual power to offer charity? That same sudden recollection took me back, too, to the idealism of my college years. Education challenges the assumptions which surround me. Encounters with people who have lived in different times and places help me to see my God, the world, and my relationship with both in a whole new way. My life will be better lived when I don’t simply ask the questions I have been taught to ask. I really wonder: what will happen if I just turn off the automatic sprinkler system?